Player: Kevin Martin. Year: 2005. Sport: Basketball. You may have to wait to get a combined invoice if it did not combine automatically. Team: Minnesota Timberwolves. Player: Kevin Martin. Manufacturer - Panini. Card Manufacturer: Panini. 2015-16 NBA Basketball Cards. Breaking cases of every new set across all major sports as well as many non-sport and even more obscure releases. Kevin Martin. card number: 97. 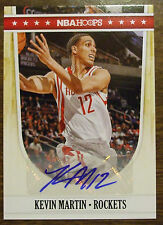 2013-14 Select Prizm Gold. Team: Minnesota Timberwolves. 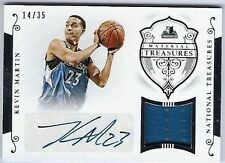 Set: 2014-15 Panini National Treasures Scripts. 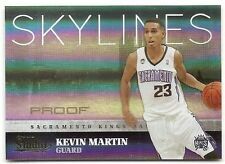 Player: Kevin Martin. Year: 2014. Sport: Basketball. Attributes: Autograph, Serial Numbered. Item#: SCKM. Player: Kevin Martin. Year: 2014. Set: 2014-15 Panini National Treasures Material Treasures Signatures. SetType: Insert. Sport: Basketball. Team: Minnesota Timberwolves. Item#: MTSKM. Team: Minnesota Timberwolves. Year: 2015. Player: Kevin Martin. Item#: 122. Sport: Basketball. Manufacturer: Panini Group. Set: 2015-16 Panini Excalibur Treasured Ink. Year: 2015. Player: Kevin Martin. Manufacturer: Panini Group. Attributes: Autograph, Serial Numbered. Team: Minnesota Timberwolves. Sport: Basketball. Card#: 163. 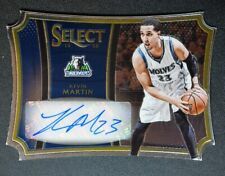 Player: Kevin Martin. Year: 2005.